Start by assembling the sandwich. 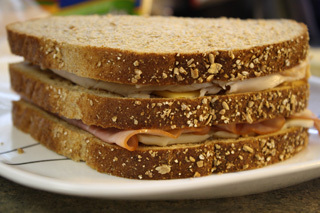 Place three slices of bread on a plate or flat surface. On one piece of bread, place American cheese, then turkey, then American cheese. 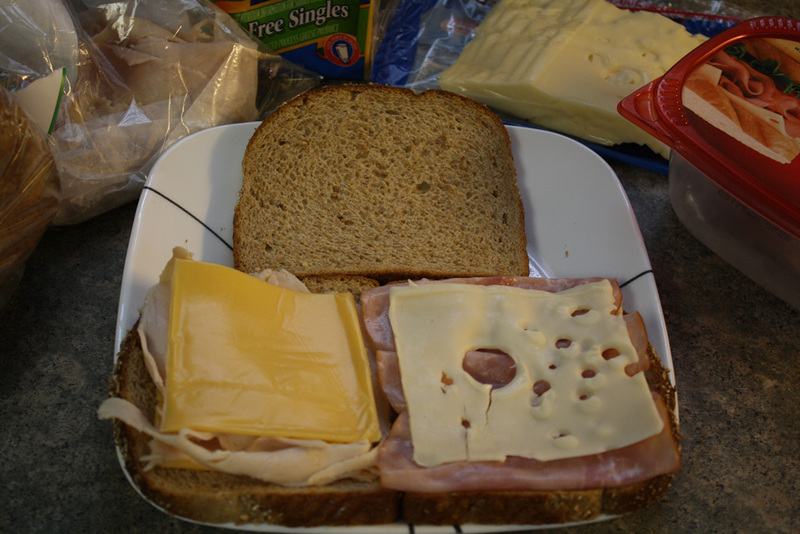 On the second slice of bread, place one slice Swiss, then the ham, then more Swiss. Put the third piece of bread between the two and pile them together. 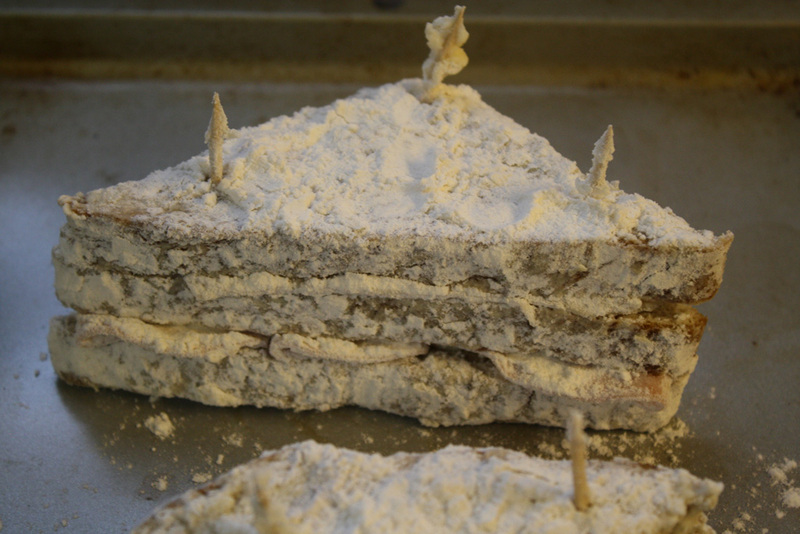 Put toothpicks in the corners to hold the sandwich together. *Recommendation: some people batter and fry the whole sandwich; then cut it into quarters. As I was trying 4 different styles, I cut my sandwich into quarters before dipping. It worked well and made it easier to turn it in the oil. In a small bowl, beat the egg and mix in the water. In another bowl, blend the flour, sugar, salt, and baking powder together. 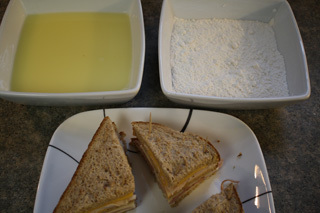 Dip the sandwich in the egg mixture and then in the flour mixture, making sure to cover the entire sandwich evenly. Set aside until ready to cook. For frying: heat about 1-2" of oil in a 9" stainless steel frying pan until hot, about 3-5 minutes. 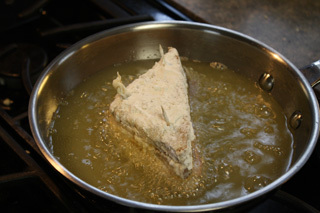 Use a metal spatula to place the sandwich in the hot oil. Cook for about 2-3 minutes on each side, or until it is golden brown. Place sandwich on napkins to soak up the excess grease. For baking: preheat oven to 350F. 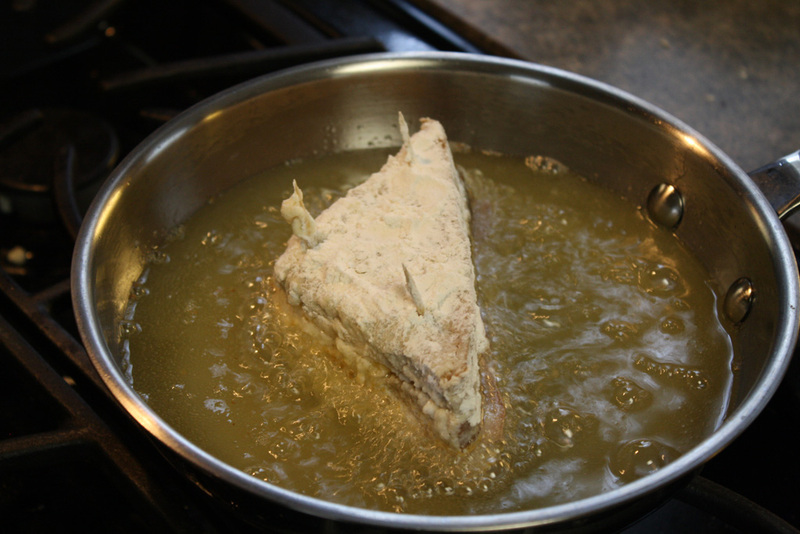 Place battered sandwich on a cookie sheet and lightly spray the top of the sandwich with olive oil cooking spray. Cook for 10 minutes. Then turn off oven and broil in High for 2-3 minutes or until top turns light golden. When your sandwich is cooked, you are ready to plate it. 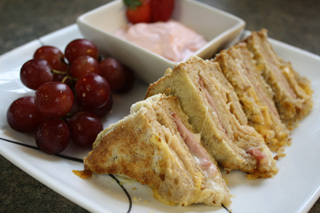 Cut sandwich into quarters (if you haven't already) and serve with a side of strawberry cream cheese. This meal goes great with fruit salad or a side of your favorite fries! 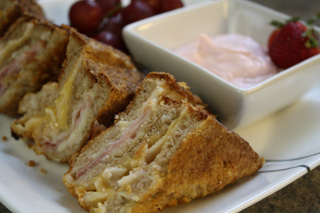 Now for the answer to my age-old question: can the Monte Cristo be delicious as a baked sandwich? Well, I tried both versions of the Monte Cristo Sandwich and decided that the baked version actually tasted better; of course, they were both delicious! I hope you enjoy this meal as much as I did!